(From Canon lens literature) This is the lightest EF lens of all at a mere 4.6 oz. (130g). Compact and high-performance, standard lens. Its Gaussian optics provide sharp delineation from near to far focusing distances. The color balance is excellent for a standard lens. This lens is one of 6 different 50mm lenses that we did a shootout with. Senior tech Jim Tanner wrote up the test results for each lens on a comparative basis, with charts and graphs showing how each lens did compared to the others in the test. The graphs for this don't fit our usual layout well, so we've assembled the resulting "Tanner Report" into a full page that opens in a separate window. This will let you see Jim's charts in all their glory, yet still be able to access all our normal test charts, back on the main page. Read the Canon 50mm f/1.8 Tanner Report for the full scoop! From a sharpness standpoint, the 50mm f/1.8 on a 5D body looks surprisingly similar to the same lens on the 20D. Corners do get softer, but not as much as we'd normally expect when moving to a full-frame body (but then they were pretty bad on the 20D to begin with). Things don't improve quite as quickly when stopping down, although the central super-sharp area is actually broader at f/2.8 on the 5D, thanks to that camera's larger pixels. As is often the case, chromatic aberration is also helped by the larger pixels more than it's hurt by the larger image circle. As we might expect, the impact of the larger frame size makes itself most felt in the areas of light falloff (aka vignetting) and geometric distortion, both of which get quite a bit worse. Light falloff hits a maximum of just over 1.27 EV wide open, and is still 1/2 EV at f/2.8. It finally flattens out at about 1/4 EV at f/4 and above. Geometric distortion isn't horrible, but is nonetheless quite noticeable at 0.46%. Overall, this lens isn't quite the slam-dunk deal on a full-frame body that it is on a sub-frame camera, but still represents a very strong value. If you don't want to spring for the 50mm f/1.4 (which is extremely soft at f/1.4 anyway), or the new ultra-expensive 50mm f/1.2L lens (which we haven't tested yet, as of this writing in late September, 2006), the 50mm f/1.8 could still make a worthwhile contribution to your lens kit, at a bargain-basement price. A great lens to start with. Sharpness and colors are excellent. My lens is sharp at the center even at 1.8 if you can nail the focus, although it does have some dreamy effect. With an APS-C -if you have a full frame you will probably be able to afford the 1.4- the equivalent focal lenght is around 80 mm, which makes it perfect for portraits. What bothers me about my copy is that focus sometimes misses target at 1.8; but for the price you can't complain. Sometimes I use 2.8 because focusing works much better -although is noisy and slow-, but then if you have highlights in the background they will appear as pentagons instead of nice circles, which is not so great. Despite that, it is a little great lens and extremely cheap for what you got! This lens was my first lens and I loved being able to use a low f-stop without having to pay an expensive lens. Therefore, this is really the lens I tell everyone to buy when they start out photography because it will be very useful to learn and see the big changes in the depth of field with the f-stop. Therefore, it is a good lens for people starting out photography. As I am now really into wedding photography, I upgraded to the 50mm 1.4 because of the added f-stop and the higher quality of built and its faster AF and better crispness. But if I had not gone into full time wedding photographer, I would have stuck to this lens because it is such a good value for its price and I love this focal length, either on APS-C or full frame. Build quality - it's very light, it rattles a bit, and feels like I could break it squeezing it in one hand. It doesn't always lock-on first time with focusing, USM lenses are better in this respect. Its image quality is beautiful - I've now started to realise why the pro's say that 'every Canon owner should have one in his/her bag'. It's soft at f1.8 and doesn't really start to sing until f2.8 but from then on it's a dream. Rich colours, and with pin-sharp resolution that even shades my 17-40L. Its compact size and low weight make my camera feel so much more wieldy too. By far and away the best £60 I've ever spent on camera gear. I LOVE this lens. one of the must-have lens for starters..
IQ is superb. it's super sharp, has a nice bokeh look, and comes in a compact-lightweight form. from price/performance perspective, it has no match. You can make professional-look images in less than $100. If you really need to justify this purchase, it's not for you. It's so cheap and the image quality is amazing. Cheap! Bokeh! Image Quality! Small! Fast! *UPDATE* My latest music video was shot with the Canon 50mm 1.8 and Sigma 30mm 1.4. The 50mm was primarily used for closeup shots of the artist's face. Recorded with a Canon 60D at ISO 3200, this lens saved the night for sure! A keeper! Visit my FB page to get updates on new videos and specific gear used so you know how it was shot. Also feel free to ask questions about anything camera/video/photo related. To make it short, get this lens! Especially as a beginner. It is cheap, and you get to experience why fast lenses are desired. You can't ask for much about this lens for the price. You get so much for the little you pay for. Ideally for crop, you would want something a 28mm or 35mm lens because mounting this 50mm on a 1.6 lens it performs like an 85mm lens on a full frame. This is a good portrait lens. A good lens to make your subject stand out. Perfect lens for a beautiful blurry background (bokeh). An okay street lens because it is light and small. Average performance wide open at f1.8, my copy was the sharpest at f8. Just attached this to a basic Eos 1100d and the image quality is...superlative. As mentioned by many, this is not for anyone expecting the bells and whistles of expensive zoom lenses. But, the image quality just blew me away! Candid shots - whether it is portrait or landscape. I still cannot believe the sharpness of this little lens - sharp as a razor. I just don't care about the AF or Plastic feel - its better not to fret about these little things when the lens performs like a gem! I disagree with people trying to treat this as a disposable lens - if a good copy falls into your hand, I think you need to preserve that carefully. A ten or twenty times costlier lens may or may not give this same output!! Lightweight and affordable, the Canon EF 50mm lens--which offers a fast f/1.8 aperture--is an excellent lens for people who prefer a fixed focal length. Canon's lightest EF lens at a mere 4.6 ounces, the lens boasts a traditional Gauss-type optical design that delivers a sharp performance even when wide open. As a result, the lens provides an image that's extremely close to how your eye perceives a subject, making it excellent for portraits and images that require a natural depth of field. In addition, the lens focuses as close as 18 inches, helping you take extreme close-ups. Finally, the lens offers an excellent color balance. As with all Canon lenses, the lens carries a one-year warranty. * Focal length: 50mm * Maximum aperture: 1:1.8 * Lens construction: 6 elements in 5 groups * Diagonal angle of view: 46 degrees * Focus adjustment: Overall linear extension system with Micromotor * Closest focusing distance: 1.5 feet * Filter size: 52mm * Dimensions: 2.7 inches in diameter, 1.6 inches long * Weight: 4.6 ounces. ++PLUS++ Deluxe Accessory Kit: 3 pc Filter Kit: UV/ Polarizing filter/Fluorescent correction & Case - Protective Lens Pouch with Drawstring Closure - Cap Keeper Front Lens Cap Leash - Lens Pen Cleaning Tool - Advanced Micro Fiber Cleaning Cloth. Overall, the lens provides very good IQ - pics that are sharp and have very good colour - for quite a low price for the quality. It's actually a no-brainer that someone who shoots Canon should have this in their toolkit, especially as it provides an excellent intro to prime lens. This is not to say that the lens doesn't have its shortcomings. Its AF is rather slow and noisy (not that much of a problem in most situations, but it does limit the lens' versatility). It is also quite short, sometimes making it difficult to hold my camera (500D) steady; this is compounded by a rather wide focus ring. Moreover, the lens produces a bokeh that can be rather rough and sometimes more pronounced than one could really want, although I can see how this could be used for artistic purposes. This lens has been recommended by many people to a beginner photographer as the first lens after the kit lens. I´ve had this lens for over a year now and have had sort of a love / hate relationship with it. The cheap plastic feel and the almost impossible to turn manual focus ring are the main reasons for my dislike for this lens. It does make a great portrait lens and after some practice you will be taking much better portrait shots with this lens then with the kit lens. However where this lens really excels, and the reason why this small lens always has a place in my photography bag is because it is really incredible in low light night photography. I normally shoot this lens at f/2.0 as I find f/1.8 a bit soft but still somewhat acceptable when needed in a pinch. Shooting at f/2.0 in AV aperture mode with 800 ISO produces amazing night time results with my 450d/XSi. Overall Opinion: Although the build quality leaves much to be desired, I have not experienced that many Autofocus problems, even in low light and have gotten photos that I would have otherwised missed. For a beginner photographer on a budget highly recommended performance for the price. Overall rating is image quality based on price. I have been using this lens for 4 years and still love it! Great on APS-C, great on FF. At f1.8 not really sharp, but beautiful atmosphere for portraits, from 2.8 like a razor. AF is accurate, but little bit slower. I had a Sigma 50/1.4 for two months but finally I sold it and kept this small gem. Super lens for weddings, portraits, general purposes. Absolutely recommended!!! Canon is an expert when it comes to springing up surprises. It builds some outstanding quality lenses while running an unnecessary mad pixel race in their bodies. Now I can safely talk about the Canon EF 50mm f/1.8 II as I’ve used it substantially. This is the gem of a portrait lens. It can capture the tiniest details with lovely colors to the level unimaginable by photography until now. I don't know much about other brands as I have not used them however, I did use Sigma 50mm f/1.4 lens together with Canon. The Canon simply puts the Sigma to extreme shame in performance. Sigma misfocused on most of the occasions whereas Canon nailed all perfectly and brought up all the minutest details not visible to human eyes. I don't care about the build quality and looks as that would unnecessarily push prices up. This is a dream portrait lens and Canon shooters must have it in their arsenal. Ignore all the negative remarks about its looks; rest assured your main objective that is the results will look outstanding. There seems to be some contention on this lens's image quality. I must have an exceptional copy, because it has bested many, many other lenses I've owned in this department, and this is at all apertures. It's criminal how close it comes to my 200mm f/2.8L. I mean that. The autofocus is very slow and brutally loud, and the build is awful if you've owned any other lens (if it's your first, you won't mind), though it is nice to have a usable piece of glass that's so light. The worst thing about it is that despite its problems, the image quality and price are so good it's hard to justify paying more for the 50mm f/1.4 USM. If you're a beginning photographer and shoot Canon, you have to get one. It's mandatory. Construction quality and noisy during focus. Although soft at F1.8 until less than F2.8, i cannot complain because this lens is a bargain. But it produces very good enlargements at smaller apertures (F2.8 and beyond). On a Canon 7D, this makes a good portrait lens. I bought this lens, mainly because I just bought a new camera, with a 135mm 2.8 soft focus lens (for portraits) but decided the minimum focus was just too far away - researching the 50mm 1.8, I decided to try it out and I loved it! In fact, it's better than the 135mm 2.8, in so many different ways. It lets in a lot of light with the 1.8 max aperture, it can focus easily to close subjects, it has an AMAZING optical quality for such a little thing. The best thing is the price, I can't believe how cheap it is! I definitely prefer prime lenses to zooms now, due to the sharpness. This will be my portrait lens AND landscape, macro, standard etc etc. Thank you Canon for making such a perfect lens. My next buy will surely be the 50mm 1.4 (although I have heard it isn't much of an upgrade). This is my first prime lense I picked up because the price is very cheap. The lense also feels a bit cheap when you first pick it up. With this being my first prime, I can't really compare it to many others but for it being my first I have enjoyed it so far. Pretty much a lot of what is said in previous reviews is true. The AF can really go haywire in lowlight. The focus is loud especially when it's having a hard time focusing. For manual focus, it is tough to find the focusing ring and feels very loose. It's very light, but feels really cheap with a plastic toy sort of feel. Overall when you work in good light, the AF is pretty fast. Image quality is pretty decent. If you don't have a prime lense in your bag and you want to try out a faster lense, I would definitely recommend this one. It's price can't be beat as far as the quality goes. This lens is probably the best bargain for its image capabilities. Relative to the money you spend, image quality is excellent. You may want to shoot at f/2.8 for sharper images (but when f/1.8 is needed the lens isn't at all bad). Here I will describe some weak points and may seem that they are a lot, but I really believe that when someone doesn't want to spend more on such a lens this is the perfect lens to get. 1. Plastic feel, manual focusing ring not the best. This does not affect performance so if you are cool with that (I am) that is fine! This lens is perhaps one of the best image producing lens for its price. It produces sharp images and wonderful bokeh. The sweet spot for this lens on my T2i is f/2.8 and the images are pretty sharp. Wide open, the images are a bit soft. However, they are almost as sharp as my images from my Canon 85mm prime lens. This focal length is perfect for portraits and works wonderful producing bokeh. Remember that 50mm used was the standard focal length back in the day in which manufacturer's evaluated slr cameras. Many people complain about the cheap build qualityfor this lens. It does feel cheap and light in your hands and it sounds cheap when it operates. It does look like it came out of a Cracker Jack Box. Remember, It is only $100.. and excellent for the aspiring and amateur photographers. Just take really good of this lens and dont throw it around in your bag; It should last you years and years. The cheapest way to make portraits and to get used with a fixed focal lens. Quality is great, as long as you don't dare to go below f/2.0 (which is only very slightly darker than 1.8, so no real loss). The AF should be renamed to "AntiFocus" - if light is bad, you might guess better by hand. Things seam to get better around and above f/4. It's not bad bayonet cover, but I had never see more harsh images from other primes. Let's face it for this price you won't get a better portrait lens. It's a must have for any photography starters on a budget. It'll allow you to take pictures you just cannot take with your standard kit or even most zoom lenses. Got it for a year, once I got more serious about my new hobby I updated it for the 1.4 model, sold it for the price I bought it. It's very cheaply built, doesn't always focus correctly, and manual focus is more or less useless, so anybody who's got some extra hundreds in his pocket is better of going directly for the 1.4 version directly. But still a nice starter lens to fall in love for prime lenses. This has got to be the best bang for the buck of any lens Canon makes. If you learn how to use this lens to get the best out of it it will give you some stunningly sharp images for the price. It is super light, and small, I think the lightest lens that Canon makes so its easy to take along with you. My copy of this lens is not very sharp below F2.0 ( I have read that some are better than others so its luck of the draw i guess). Not great for low light conditions, focus hunts around quite a bit and with no IS you are better off looking at other lenses if you are wanting a great lens for indoor low light unless you are planning on using a tripod. Bokeh or (background blur) this is one spot that is fairly annoying since it would not have cost Canon much more to use rounded aperture blades which would have at least helped. But with this lens you often see the hexagons in the background and its not often nice and soft. so you have to be careful with this. I am sure they really just want to sell there more expensive versions of the 50mm primes. I've tried a number of primes and L-zooms, but none of them has been able to outresolve this bad boy. This is the only lens I've tested that manages to outresolve the 450D-sensor and give perfect per-pixel-sharpness at f/3.2 or higher. At f/1.8 it's a bit soft - especially around the edges. But for me, that softness generally isn't a bad thing. Instead it softens up the DOF so you don't get that hard in-focus-out-of-focus-line, and for some reason images taken with this optic at f/1.8 tend to become realy esthetically pleasing. When I tried to write the cons for this lens, I stopped and could not force myself to write anything. As most of the others wrote, this lens has a very slow AF, AF motor is very noisy and there is no usable focus ring on it. I sometimes feel it may break to pieces when it tries to focus! However, I try to be fair. This is the least expensive lens in Canon family. It is a 1.8 lens and it is very sharp if you step it down to F4 and up. It is a very good portrait lens on an APS digital SLR. It is very light and you can put it in your pocket. It looks like a toy, feels like a toy and sound like a toy, but wait till you see the results and you will realize you've got good glass for every penny you've spent. If you are going to make a living out of a 50mm lens, get the L version, but if you are a hobbyist or you just want to experiment, you will not regret buying this lens. This is the "nifty fifty", and I love it!! The previous one has some issues. I've got them fixed. Now it's fine. I owned this lens for 2 years. Excellent optics. Extremely sharp from f/4-8. Actually, I don't want to complain anything about this lens. It's so cheap that I can complain nothing. OK, that's my fastest lens. And the cheapest. However it has one trick in it's sleeve and it keeps me coming back to it: IQ. When focuses (most of the time) it provides great detail, crystal image and unmatched for this price low light shooting. Using it with Canon 5D was a shock. No flash was needed most of the time. With the 40D it made me realize that focusing is a bit of an issue. Mostly in low light situations. In bright daylight all is razor sharp. This lens is a great value because of its price and its amazing sharpness once stopped down a little. I wouldn't recommend it as a first prime on a 1.6x body because it is quite long and focus is plain crap. Unless you can't afford anything else of course. So yeah, the manual focus "ring" (if you can call it that) is very hard to operate because it's tiny, poorly located and offers almost no resistance. It can still be used but it's definitely not fun and I often wish I had gotten the f/1.4 for that reason alone. Autofocus does not seem very accurate and will miss significantly every now and then. On the other hand, mine is not noisy at all. It's definitely quieter than my 35mm f/2 and not much noisier than the 17-85 USM. The plastic mount feels cheap but is not a problem in practice given how light the lens is. I've taken a few interesting shots with this lens but still wish I had had the option of paying 50% more for a decent focus ring. I don't use it very much and will probably replace it someday. I'd had this lens for about a month on my XSi. It's IQ is amazingly sharp and renders colors just right. People complain about the build quality; its just fine. It might not ever leave the camera. At the end of the day, I have to say: wow! I mean, you paid the price for perhaps 10 food court lunch and you get thie mid-distant lens with f/1.8 aperture, and I have to say the quality comparing to the price, it's quite worth it. The only thing I might be complaining about is the corners, they're like darker than ever from the center on my cropped frame body, and the plastic feeling of the lens is definately worse than my two EF-Ses. So, the verdict would be that if you need a fast aperture lens with a very tight budget to fight, then yeah, go for it, but just don't expect much, despite its low, low price. The IQ is really good. Everything else works really well and for under a 100.00 US, I'm not going to complain about the build. I have to agree with many of the people here who brought up focus problems. I am new to DSLRs but have been taking digital pics for several years with good cameras, and never had this much problem getting an in-focus shot. It probably is low light most of the time, but I found a workaround, although it takes longer to achieve: My new Canon xSi has the option to use Live Mode focus during live view on the LCD, and I get far superior focus this way which no doubt allows the lens to achieve its full potential. Using live focus, I can see every brick in the highrise maybe 1000 feet outside of my window, but the shot I took with standard focus was noticeably fuzzier. And many of the first shots I took at dusk yesterday, were horribly blurry even though I did everything right. I'd have gotten better results with my point and shoot. I was thinking of returning this lens, but now that I know I can get razor sharp shots even in very low light using Live View, I'll probably keep it as something to experiment with to get the full potential of my great new camera at a low cost. This lens has taught me how to shoot properly. Granted, it feels cheap, it focuses poorly many times, the bokeh is whack at small apertures, there is no denying the fact that there is a reason why people swear by primes. If you've read my reviews, I'm an uber-zoom freak. I bought the 50 1.8 just for fun. Then, slowly, my zoom lenses started dying on me: first my 17-85, then my 17-55. I was pretty much left w/ the 50 and a Tamron 28-75 [until I got my Canon 70-200 f/2.8]. Using the 50 extensively for the past 6 months now, I can confidently say that I truly LOVE this lens, despite its many annoying quirks. Like my Tamron, there's no escaping it's excellent IQ, it's atrocious AF speed, it's cheap build, and it's lovable factor that just seems to grow on you [for me at least]. Perhaps an upgrade is in the order, but first, I must absorb the 70-200 hit I took :-). Bought it for portrait work a few months ago, but it soon started having focusing problems, especially in low light conditions. I bought this lens based on an almost unanimous recommendation on every forum that "you have to have this one, especially with the low price". I was very disappointed with this product, and subsequently sold it for $40.00. For indoor shots, it never seemed to want to autofocus. So when you give up on the autofocus, you find the manual focus ring is just too small (and cheap feeling) to actually use effectively. Manual focus ring seemed sloppy, almost loose. In the many months that I owned this lens, I bet I only put it on the camera 10-15 times at most. My only other lenses at the time were the 18-55mm "kit" lens and the 75-300mm f4-5.6 III. To me, even the kit lens seemed to have better optics, focusing, etc. I guess it might be possible that I got a bad copy, but I expected so much more from this lens based on other folks positive to almost glaring reviews. If you really want a 50mm prime, I would suspect spending an extra couple hundred on the other 50mm lenses from Canon might be a better purchase (although I have no first-hand experience with the other 50mm's). I bought the lens because of the rave reviews and it does not disappoint. The lens is very light and does feel plastiky but that doesn't matter. I use it much more often than my 28-135mm for my kids. For the price, you can't go wrong. The 50/1.8 II is a great value-for-money lens, the best deal with Canon at the moment. I've using it for 5 years now, intially with the EOS film Rebel ( the famous Rebel 2000) and now with 350D. Because it effectively becomes a 80 mm lens on the 350D, it's not that practical a lens for my needs, but I still use it. Its best qualities are remarkable contrast, and sharpness. Both suffer at higher apertures,though. AF appears hesitant in low light (no USM), but then again, when it focuses, it will be right on the money. The bokeh has been said to be poor, which, some say, makes it a not-so-good portrait lens despite the convenient 80 mm focal length. I think that's unjust. I have shot many good portrait shots with it (with heartwarming praise from those shot), and any other lens other than L zooms falls flat in comparison. Buy this lens, and use it as a short telephoto or a portrait lens at 2.8 and above. Highly recommended. At this price, this lens is a no brainer... just get it. It takes great portraits, it is small and light so you won't mind bringing it along on a shoot. Yes, it is plastic and could be made better. Unless you routinely bang your camera around or drop your camera bag, you'll probably be ok. This lens is a great value because of its low cost and excellent sharpness at f8. Great for portraits on a 1.6x body, or for still life. The main downside for me is that when used open to get background separation or because of low light, bokeh is very poor.. don't know how to describe it... it has a chunky appearance rather than being smooth. At f1.8, depth of field is also less than the autofocus precision of 1.6x Canon bodies, and maybe my lens is slightly front-focusing... the result is that about 50% of the shots at f1.8 are from slightly to more substantially out of focus (especially in low light situations, and almost always with focus in front of the subject for my copy). AF is ok at f4 or up. Despite these issues and the cheap construction, I think this lens is great if you plan to use it at f5.6-f8, hence my recommendation. Very sharp. ... or at least, when used on full frame cameras. On 1.6 crop, this becomes an inconvenient lens: too short for tele, too long for a walkaround. Too long for group photos. Excellent for portraiture, though. * There seem to be some defects on the front glass of my copy. A few specks, that look like a lack of coating. Or a smallish crater on the glass. It does not spoil images normally, but manifests itself in the bokeh - as specks on the out-of-focus highlights. * While not really a problem, I'd like more focus ring travel. In conclusion - if you like the "classic" 50mm look on a crop dSLR - look at the 28-35mm range. The 35mm f/2 is certainly not a bad choice. If you need 50mm exactly, go for the 50mm f/1.4 - that's a good lens, albeit not usable until f/2. If you're a photographer, this may be the best lens of all time. For the gadgeteer and equipment collector, this is not your lens. I've heard this is "The" lens to have, and I was looking for a fast lens, so I bought it after weeks of research. Really is a great lens for the price though. The f1.8 is a little soft, and I'm having some front focusing issues. I'm going to send it back and get a new one that will hopefully fix it. The plastic construcion is VERY cheap, of course you only paid $70.00 for it, so what did you expect. At f5.6 it has been tack sharp. I'm using on a Rebel XT and must say I enjoy it. Here's one of my shots using the 50mm lens at f6.3, hand held, laying on the ground at 1/125 exposure. Plastic Plastic Plastic. Feels like you only paid $75 for it. Given the price, there's really no good reason not to buy this lens. The price is so low, it's one of those lenses you go ahead and buy just for the heck of it. I already had the 50mm f/1.4 when I decided to buy this one for that very reason -- just for the heck of it. Given the choice between the two, there's really no question that I prefer to use the f/1.4 lens, but if you're trying to be frugal and aren't sure you want to pay the extra for the f/1.4 lens, the f/1.8 will not disappoint when it comes to overall image quality. Certainly, this lens has its limitations. If you like to use shallow depths of field with nice background blur (bokeh), this isn't the best lens for that. I found the bokeh to be somewhat messy and lacking in smoothness when compared to the 1.4 and especially the 1.2 lens. While its autofocus is relatively speedy, it doesn't feel as fast as the 1.4 lens in part because it's substantially noisier -- you're made much more aware of it focusing. The front focus ring has a very small grip-width and feels chintzy, but probably not as bad as the EF-S 18-55mm lens. Also, if I was interchanging this lens a lot with other lenses, I would be worried about the long-term wear on the plastic mount. But, hey, who cares . . . it's only $75! This is a real bargain, and a great buy for the frugal shopper or someone looking for a decent backup to their wider-aperture 50mm lenses. Very sharp when stopped down, soft at f1.8, much better at f2.5 and excellent over f4. Good for portraits on a 1.6 crop camera. I have been impressed with results. AF is not fast and motor is rather loud but at this price it's hard to fault... I missed focus quite often when used in continuous AF with a model walking towards me -> switch to one shot AF and shoot fast! Get one! You will not regret it. 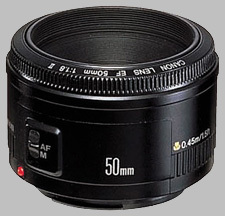 This lens fills a very specific need - a 50mm "portrait" lens with a relatively large apeture. The build quailty isn't all that great, but it is lightweight and does the job decently well. For the price, it's really hard to match. If you're looking at getting a body + kit lens, I'd highly recommend saving your money and just getting the body + this lens for the same price. This lens is a no brainer. It's cheap, and stopped down (2.2 or so) the image quality is excellent. At 1.8 it's still OK, and together with the ISO setting of a DSLR it's perfect for available light photography. With the 1.6 crop factor of most Canon DSLR it's more like an 80mm lens, and as such a perfect portrait lens, or a normal lens for the tele inclined. Since it's so lightweight it makes for a great macro dioper when reverse mounted in front of another lens, but better check to make sure the image circle is wide enough for the other lens. Reverse mounting directly gives you another good cheap macro option, although it's more difficult to handle (no AF, no automatic aperture). Considering the price, this lens is a must. My 350D with this lens attached is smaller and lighter than many of the more serious compact digicams. Fantastic sharpness and bokeh. Great for portraits. It's also flimsy and too light but I don't care. This was the first lens to go on my Nikon N80. Just holding it in the store made me queasy – it’s built like a BigMeal toy. But what it does, it does very well. It’s fast, sharp, and small. On the N80 it makes a very tidy, go anywhere kit. And it’s so cheap, there’s no reason not to have one. On a reduced frame camera it makes a nice available light portrait lens. This was my very first lens, I was a little (very) disapointed with it's construction but i was amazed at it's excellent image quality. The AF is a little sloppy, and not precise, even on a 30D, at 1.8 it has some CA and very vignetting! The bokeh it somewhat harsh but you can live with that. It's point of maximum shapness begins at 5.6. Overall a very good start lens. This is a good lens overall with nice bokeh. My only gripes are with the slow and noisy focus, and the size and feel of the focus ring when you are manually focusing. Other than that, I really don't find this focal length as useful as I thought it would be. As an F1.8 lens, I thought it would be great indoors, but it's really to long for that on a 1.6x crop camera. Next time I would buy a 20mm or 24mm lens with the widest aperture I could. Of course, at almost 80mm equivalent on a 1.6 crop camera, it's probably a pretty nice portrait lens, but I don't do many portraits! Bought this lens after using the kit lens for some time, so I could appreciate the difference in sharpness & IQ. I suggest not using this lens wide-open unless you're using it in poor available lighting (when there is no other way to take the shot without using the flash) because it's soft & lacks contrast at f/1.8-f/2.0. It noticeably improves around f/2.5 & continues to improve until around f/8. f/5.6 seems to be the sweet spot in my personal experience. Build quality-wise, it's true what they say, you get what you pay for: it feels cheap. The plastic body & lens mount means it can't stand much rigorous use. The focusing ring, which is very narrow and located at the very front of the barrel, is almost unusable. Don't bother protecting the front element with a filter, a cheap uncoated one would just degrade your images while expensive ones aren't worth it considering the price of this lens. If it gets damaged beyond repair, just buy a new one. AF speed is so-so, not ring USM-fast, but not slow either, which is to be expected since this lens uses a conventional micro-motor. It's not silent either. The good news is that it doesn't tend to focus-hunt in poor light as much as the kit lens, probably because of the wider maximum aperture. Overall, this is very much recommended considering this is the best bang-for-the-buck Canon lens. It delivers images that are sharper than some of the several-times-more expensive zooms at comparable apertures. It provides more background blur for portraits than even the fastest zooms (although the bokeh is rather nasty due to the 5-bladed aperture). The next step up from this lens, the 50mm f/1.4 USM version, costs 4-5x more than this one. P.S. Get the now-discontinued 50mm f/1.8 Mk.I if you can. It has a better build quality (metal barrel & lens mount), wider focusing ring, distance scale and slightly-better image quality. Before deciding to buy this lens there are two things that you definitely have to consider. First, forget the 1.8 advertised maximum aperture, or you'll risk serious disappointment. Pictrues taken at f/1.8 are totally useless, unless rescaled to something like VGA resolution. Also, at that aperture the out-of-focus highlights feature a very distracting thin, greenish ring. Second, my (objectionable) opinion is that the usefulness of this lens is somewhat limited on a 1.6 crop body. 50mm is neither wide enough to capture buildings or monuments, nor long enough to shoot details. However, if you keep the above limitations in mind this lens can be more than satisfactory. From about f/2.8 onwards it begins to take exceptionally sharp pictures. Colors are accurate and pleasant, geometries almost perfect. Use it as a portrait lens at f/4 and you'll be pleasantly surprised. Once you get used to its limitations, this inexpensive lens can outperform all but the most expensive zooms when it comes to image quality. Yes, the autofocus is slow and noisy (it lacks any form of USM) and it feels like a toy, expecially when mounted on 350D, which too is quite toyish. But it is a 100$ lens, you can't have both cool features and good IQ for that price. Overall, I think that this lens does perfectly the job that Canon intended for it: a compact, inexpensive lens to introduce novice users to the beauty of primes. If you are new to primes you should consider it seriously. If this is not you first prime maybe you'll want to consider something else. The build quality on this lens is just horrible. But it's still useful if you need a fast lens in this range. The AF is pretty bad too. All in all, this is an exceptional lens in many ways. The constant f/1.8 aperture on a crop body makes it a fast portrait lens, but it could still benefit from some additional magnification. Of course, I shouldn't be complaining since this is neither a macro lens nor very expensive in the first place. The quality of this lens really shines when stopped down to f/2.8 and beyond. The focus is noisy but it's still very fast. This is one lens every canon photographer should have on hand. Ok, before anything we need to be fair to the price range of the lens.. Most of the people here are complaning against the cheap build, the so-so focus ring, etc. But first of all, you won't be manual focusing most of the time because of the.. umm.. not quite sure what to call it.. "short focus twist"... to change focus from the closest to infinity takes only about a half turn so its quite hard to focus accurately especially when wide open..
Sharpness is VERY good (just good luck on focusing properly, use the center) and I would recommend this lens if you're a beginner and don't have that much experience with photography.. don't be a gearhead.. use this and your kit lens first to learn what you need and want... besides, IQ isn't everything.. so what if you an L lens if you don't even know how to compose a good image? I got this lens in a kit together with a used D30 I bought some years ago. - my copy is quite weak wide open, I have to stop down to f2,2 for accetable and f2,8 for good results. From f4 it´s really very good. AF performance on my old D30 was hit and miss, on my new 30d it´s much better. Still, I can recommend this lens to anyone who is looking for a cheap, light weight lens mainly for outdoor use stopped down or for low light use when needed. I love to use this lens wide open at ISO 1600 as I can actually shoot (and get AF) by candlelight. I find it's also a good lens for night sky although the AF won't work anymore. * Cheap construction although it does make it very light. Given the price this really isn't a problem because replacement is a non-issue. * Quite soft at the corners when wide open. Inexpensible, light, small, very sharp stopped down, center sharpness wide open enough for portraits. Poor build quality, average AF, very bad corners wide open. This is the lens that brought be in the world of primes. Compared to the kit zoom, its wide aperture allows for wonderful low light shots and DOF control. Beeing quite soft wide open (especially in the corners, but it may not be a big problem for portrait shoots with the subject in the center) it becomes really sharp over 2.8, and incredibly sharp over 5.6. On a DSLR its equivalent focal length isnt sometimes wide enough, but quite useful for close portraits. The only drawback is the really poor build quality : plastic mount, small autofocus ring... It really gives the feeling of a cheap lens. Anyway, it's the most wonderful cheap lens ever! Light, fast, sharp and cheap. Construction as cheap as it is. Very fast, very sharp, inexpensive (around 120 here in Mexico) and small prime. A definitely must have for every Canon shooter. Mounted in my XT, it becomes a very unintrusive combination, just bigger than a high end P&S. On my 5d, it shows it's flaws, specially on the borders of the frame, but stopped down to 2.8, it's a really good performer. Hard to beat for $90. The lens is very nice if you stop down to f/2.8 or so, and makes for a great portrait lens. My only complaint is that I always seem to want to get an inch or two closer to my subject than the lens will allow. Not sharp. Poor building quality. Not suitable as a standard lens for digital SLR with 1,6 cropping factor. I bought this lens second hand. I did not find it very sharp, but I must admit I could have found a bad sample. The lens has a poor building quality, but you cannot pretend much for the price it costs. The main problem is that it becomes a 80 mm effective focal on my EOS 20D, quite useless to become the standard lens. For $80, it's hard not to buy this lens. The build quality is not inspiring, but it is suprisingly sharp, even wide open. CHEAP!!! You get much more than you pay for. does it really matter? see above. I am not going to bother elaborating anymore as everyone preceding me says it well enough. Just get the lens already. This is the lens everyone recommends to get when you buy a Canon DSLR (unless you are buying one of the pro bodies and have money to burn). Why? It is super inexpensive, but has very decent image quality, and is really the cheapest way to get something that will work in low light. After using it for a year, I agree with the consensus. The only caveat is (mentioned also by other users I am sure) that in low light conditions sometimes the lens has trouble focusing. This can usually be overcome, but sometimes that fleeting shot is alreay gone. The focus is also slow and loud compared to USM, but that is certainly to be expected in a lens in this price class. If money is no object, you might consider the 50 1.4, but otherwise, this lens is hard to beat at the price. Wow! What a great lens for $80! It is one of the best secrets in the Canon's lens product line. Every one of us the canon followers should have it. It is fast, sharp, great portrait lens for D-SLR. Well, it is built like a Mcdonald's kids meal toy but for the price I shouldn't complain. Highly recommended! Bargain price, sharp image quality, bokeh possibilities, extremely light-weight. Build, build, build (! ); AF sometimes hunts in low-light. I bought the 50 1.8 MKII because I wanted to learn about low-light lenses. It was continuously recommended for its price tag and the quality of its image. This lens does not disappoint in either category. Not only does it open possibilities to learn about DOF and the creation of rich Bokeh images, but also -----when stopped down to 5.6---- produces extremely sharp images from corner to corner. It is ideal for portraits as well as low-light situations, specially given that it compares favorably with much more expensive alternatives. The only serious fault is the plastic build which makes you wonder whether it will survive even the shortest of falls. This is the reason I sold my MKII (plastic version) and was lucky enough to find a used MKI (metal mount) in mint condition which cost me a bit more, but guarantees years of creative fun. If you can get hold of a well-kept MKI (mine is actually 18 years old, but in amazing condition), then you should go for that one. If you can’t get hold of one, the MKII is still the greatest Canon value around. You will not regret it. What shall I say? Don't know... Wasted money? Very sharp lens. Autofocusing not very accurate, especially in low light. Colour is decent. However, for $100 it is a very good lens! Like nearly everyone else's report, this is a cheap lens...and it is very sharp. Definitely recommended for users on a budget and looking for a lot of returns on investment. Great lens for portaits but watch out for overexposure on your backgrounds when shooting in bright outdoors. Another good use for this lens is to shoot still life, provided your subjects are not too small. Food shots and daily products do well with this lens. So what are you waiting for? Pop down to your local camera store and pick one up today. You won't feel cheated with this one. Having just jumped into the world of Digital SLR's I found the image quality of this lens to be great compared to my Canon S2 IS point & shoot. The Bokeh (background out of focus) is really nice and the first few candid shots I took with it blew me away. Such Bokeh was never even imaginable with the P&S. With a 1.6 crop factor this focal range can prove to be a bit tight indoors. I have found it a good range inside for head and shoulder shots. However, this lens is cheap in regard to build quality. The entire build is basically plastic including the mount. The focusing ring is rather loose on my copy and rattles a bit more than I would like. The AF to MF switch also takes a bit of persuasion to switch. Lastly, when in auto focus this lens tends to do a lot of hunting especially in darker conditions. I find myself often switching to manual focus not necessarily out of desire but necessity. With that said, for $70 this lens remains a great deal. Personally, I will eventually upgrade to the 50 1.4, but this will do just fine holding me over for a while. The image quality is good and the price is great but the construction quality reflects the price. I sometimes have to give the focus ring a slight twist to get the gearing to engage when switching from manual to autofocus. I wish Canon would upgrade this lens with USM and a little better construction. I'd be willing to pay a little more for that. Still, there's no denying that this lens is a good value with good image quality. This lens is a so cheap and deliver sharp images. For this, it's a must in anyone's camera bag. It's also a very affordable fast lens so I use to carry it almost everywhere in case I need to shot without the flash. Great for portraits and absolutely sharp compared with the kit lens I got with my 350D. Bokeh is very nice. Excellent value and definetely recommended. This is a great all-around lens for everyday use. Because of the wide max aperture it's pretty versatile if you don't know the lighting situations you might encounter ahead of time. Because it's inexpensive you don't need to baby the thing too much. Despite being the cheapest-quality lens I own, nothing bad has happened to it in the 5 or so years I've had it. A good lens overall, one that pairs really well with a small camera like the XT series. I feel quite safe putting it on just to walk around. It's a good focal length for 'shy' street photography, and the way the front element is recessed so deeply lets you feel safe swinging it around in less than ideal conditions. The manual focus switch is ungodlily stiff though... almost feel like i'm going to break something when having to use it. The sharpness at and above above f/4 will surprise you - it is as good as it gets for an 8MP camera, all macro lenses included! Sharp from f/4.0. Light. Great for portrait on 1.6 crop DSLRs. Only problem: it's a prime and sees less use than convenient zooms. I love this lens. It has everything going for it - well almost. Pair this lens with a Rebel XTI, shot raw processed with ACR and you have image quality matching what did cost 6000 USD a couple of years ago. Yes, I'm talking 1Ds with L-lens quality. It's image quality can't be faulted. Sharpness great, vignetting low, ca low and disortion low (lower than the 1.4 in fact). The build quality are it's only con. However at this price you can afford to buy, a new one if the old one breaks. A colleague of mine advised me this lens after I had to return my 17-55, to be in time for my newborn pictures. Just a lot of fun and very sharp pictures. I don't really understand much of the negative comments below. What do you expect for less than 100 bucks? It just makes for a good exercise with a prime without the risk of losing anything. I bought this lens with my 350D. I really like to have a large aperture lens, for this price seemed to good to be true. Picture wise, it is very nice to shoot portrait with this lens. The bad construction quality of this lens is one thing this lens is famous for, what i didn't realise this could lead to real problems. Two weeks age the plastic fitting on the camera broke, and i wasn't able to remove the lens. I just could turn it half of normal. On the internet i found a few other with the same problem. Luckily it broke just after i returned from a vacation, i will be very very careful using it again after it is returned from canon service. A great bargain, capable of producing better images than all the consumer zooms. It is let down by very poor build. The focusing ring is almost unusable, it has some play and no dampening at all. The inner barrel is wobly and the AF/MF switch is very stiff. It is totally plastic, including the lens mount. But all this is forgotten when you see the results. At f1.8 it is slightly soft, but from f2.8 on it is very sharp all the way to the image borders. You can't go wrong with this lens. This lens should be on anybody's camera bag. You can't ask for anything more from this lens given how cheap it is. Image quality and color rendition is better than most zooms available out there. A very good 1st lens. How can you criticize an $80 lens? Regardless of what you say, you got your money's worth! Wide open, this lens is sharp in the very center but the 5-blade aperture means unattractive bokeh. Stopped down it is very sharp corner-to-corner. It's small and lightweight and a bargain. This is good for a cheap lens. I couldn't use my 50 1.8 for many shots. I've owned it for three years and found that I could only take some close-up shots to my satisfaction. This has been a great lens for walking around and for low-light shots. It makes for a small, unobtrusive combo with a compact SLR. Sure, this is a very inexpensive lens - so the cons really shouldn't weigh too heavily in the balance. Build is cheap, but no more so than Canon's 18-55 EF-S (as one example). Focus is louder than USM motors, but still not loud, and certainly quieter than the motors in a number of Tamrons I've used. What is more noticeable for me is that the lens does struggle to keep up with moving subjects. Image quality is very good once it's stopped down to f4 or beyond, otherwise your subject better be in the center of the frame for acceptable results. At the price, there's little reason to not have this lens, unless you can afford something like 50 f/1.4. It's perfect for portraits and low-light photography. I tried a number of copies before buying one, and on *all* of them the AF/MF switch had a tendency to get stuck when switching from MF to AF, before getting to AF. It can easily be jostled all the way, but if you're in a hurry you might not get it right. Its focus is not impressive on a 350D, at least at wide-open. Since I have mostly used it for low-light situations, I can say little about larger aperture and more light situations. Very sharp, light and fast. At the price this lens is a must have. It's fast enough to use for available light and probably as sharp as any lens Canon makes. You just have to get over it's cheesy plastic feel and trust it to take sharp contrasty photos. If you have an EOS you should have this lens. There's no real excuse not to, unless you can already own the 50mm 1.4 or 1.2. It's innexpensive, light, you can carry it anywhere, it's unotrusive. it's the perfect focal length for portraits and close-ups with a 1.6x cropped sensor. and it's a perfectly addequate normal lens for a FF sensor. For the amount of money you'd spend ot buy it, this is the best bargain of any lens in the universe. Build quality is what you expect - cheap, but images don't reflect that. Just make sure you focus accurately. For the price, don't bother to put a protective filter on this thing - it just degrades quality and you;re better off risking a scratch and just buying a new copy of the lens if tragedy does strike. When evaluating the lens, repeat to yourself "It's under $100." It can be soft, it can be slow to focus, build quality is a joke. On my 20D this is an 80mm effective, so it's more of a tele than a normal, but it focuses pretty close. Filter thread is an odd size for anyone who also owns L series or "more serious" lenses. Not a problem if you are using cokin system, but if you are buying individual filters, it's a pain. If you use manual focus regularly, you might have tough time using the ring on this lens - it's small, and all the way at the front of the lens. Tough to grab if you have big meaty hands (like me). Overall, recommended. You CANNOT get more lens for your money ANYWHERE. At less than $100, it's a must in any camera bag. Let me be the contrarian here and NOT recommend this lens. Save your $80 and apply your money to a better lens. Obviously I do not believe this is a "must have" lens. For an APS-C camera the 35/2 is a much better deal, and only goes for about $160 more. On the crop body 50mm is no longer the ideal focal length for a "normal" view anyway. If you feel you still need a 50mm lens (say for portraiture), Canon makes two others that are not too expensive, and Sigma makes a very good 50mm macro that is inexpensive. It is true that these other lenses cost a bit more, but you get what you pay for. Apply your $80 to one of the above better lenses. I bought this lens years ago when I first bought an EOS camera. Never used it much then. Now with digital it is all to easy to see its flaws. The image quality is nowhere near Canon's better prime lenses. On my copy the image does not become acceptable until f/5.6 and not decent until f/8. seems to good to me! I would say it is a good buy! I like the lens. It is cheap and light, you can take it anywhere and use for porterts and low light. Usually I don't open it fully wide using appreture from 2.2 and up. The sharpness at this point is very good. I made a number of shots at 1.8 and they were not bad at all. I use it on XT/350D body and thus the real focus range is around 80mm. Therefore the DOF is also decreased comparatively to full frame body. The sound of autofocus does not bother me much, however I can't say that the AF speed is lightning fast. It is average. In the low light it may start hunting, and u need to switch to MF. The build quality does not bother me much, I prefer functionality over build quality. Also it is definitely better than such of many point-and-shot cameras. Would I recommend it? Yes - it is a bargain. Just check for quality of the lens - there were some rumors on quality assurance problems. Ok its really inexpensive lens, and it performs ok, to great depending on where you have it stopped down too. But photography for me is for fun and this lens isn't much fun. Lots of people try to get old MKI f1.8 and I would agree with that probably, but I'd probably get a 1.4 at this point if I really needed a 50mm on a crop body all the time. This focal length is good for portraits, so if you want a ok prime for a lot of them ok you can't go wrong. That said I don't shoot many portraits and I think the 35 f2.0 is a much better lens, it does cost 3x as much, but really neither is expensive for what you get. As a side note, the focusing mechanism on the 50 here is at least quiet. could focus faster and quieter, and have distance window. at least a metal lens mount! This lens is no doubt looked down upon by some. I use it all the time. Stopped down some, it yields great images. Are there better lenses out there? Of course! More expensive, you betcha! This lens could be lost, destroyed, damaged, and the owner wont be out too much money. Focus is slow and lens does not have a great, 'quality' feel to it. I pop it on my EOS 3, and it works fairly well. My gripe for this lens is the lack of a lens hood. Seems especially hard to find, and when you do, the cost is outrageous. Yes, a simple Ritz store brand hood will work, but not the same as an OEM. Not as big of a deal with this lens, but it is a pet peeve of mine in regards to canon lenses. I have not had any problems with flare or ghosting. A great 'street' lens. Thanks for reading! Cheap, fast (f/1.8) lens and thats all. Not quite sharp until stop down and plastic construction. Sure you can't wait more in this price range, but if you need fast lens with nice IQ, you better look else. OK! for rest of us. This lens is a must have in any photographers bag. The image quality is on par with the better lens from Canon. The price is on par with the cheapest 3rd party lens. Yes, the focus is noisy and hunts in low light (where it is often used), but the image quality and wide aperture are what you would expect from a lens costing several times more. If you need a low-light lens on the cheap, this is the lens for you. It's true this lens' construction quality is not very good. The focus noise is the loudest of my lenses, and sometimes not consistent in very low light. But apart from that I really like this lens. I enjoy using it for portrait photos, stopped down to f2.5 or f2.8 or more it's very very sharp. And I think it gives a good background bokeh. At first my camera (350D) had a bit of a front focussing problem, which was especially noticeable on this lens wide open (or nearly wide). But I managed to fix that and now it focusses accurately in most light conditions. Although it IS a bit soft wide open, if needed it can really be used at f1.8 - especially if you don't need huge prints or will use it at screen resolution. For example such uses include stopping action in low light (sports, camp-fire scenes, evenings, low light indoors, etc). Coupled with my cameras good ISO 1600 performance, it's very handy to produce good low light photos that way! I've had fun using this lens for a number of "non-professional" portrait sessions (mainly of my wife) and I'm glad I got this lens. It's worth the money I paid for it, it was only around £70 (from the UK). I'd recommend this lens, it's a good tool to learn photography with and get decent sharp, specific results! On a budget this is worth the investment ... versus not having a wide aperture lens. Works well on a digital for portraits. A good lens to have with you when traveling ..has problem solving-speed! I usually take it with a tube and a 1.4x Tamron TC as a macro backup - and even when walking around with the 17-85 it can get you bugs etc... so light and small. I also enjoy the high performance to price ratio ...low-cost makes using it more fun. I wont get a 50 f1.4 - this is good enough (I use the sig30mm 1.4). makes a 50mm walk-around excerise fun because it is so light. I have to rate it HIGH because of VALUE! Best EF lens from value for money prespective. Very small, very light, very cheap and very sharp. Max appature of 1.8 is great for low light conditions. A lense that I recomend for every Canon EOS owner. I've used this lens for a few years and have really liked it. It's been very sharp. My only complaint is that it doesn't have a USM like the 50mm 1.4, but it's also 1/2 price. This lens is nearly disposable at this price, but the images are very reliable.